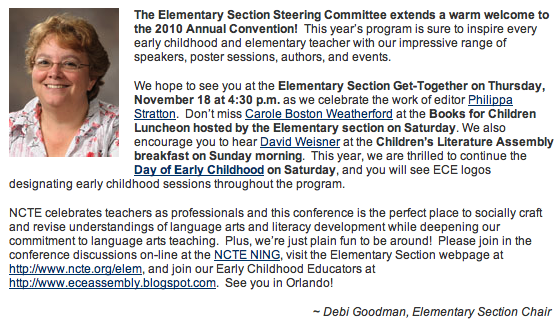 Thank you to those of you who submitted proposals to present at the NCTE Convention in Orlando! We look forward to seeing you there. Click here to view the EC sessions. Thank you to Debi Goodman and the ESSC for welcoming ECEA with open arms and for their ongoing support of early childhood educators! Click here for ECEA events that took place at the 2009 Convention.